1. I have a job! Lovin’ my cute desk and my November wallpaper. It is an accurate description of how I feel about my new job. As part of my ongoing attempt to be a grown-up, I have taken a job. I am the marketing coordinator for a company that is based in West Virginia and has additional offices in Louisville and St. Louis. This job is roughly 1000% better than I expected my first job to be. My day-to-day is a mixture of writing, design, editing, planning, and teamwork. I have this idea that God looked down at me and rubbed his chin and said, "Hmm, Kate needs a job in Louisville. How about I give her THE ABSOLUTE BEST JOB FOR HER IN THE WHOLE CITY?" I hope to blog more about my job soon, mainly to offer hope to the frazzled, weary students who are too frequently told, "This is the most freedom you'll ever have! Enjoy it now!" Take heart! That's hogwash. I live with three other girls in a big ol' house in Louisville. Having just moved out of a house with three girls whom I adored in Columbia, I considered living with three girls to be my dream arrangement, and that is exactly what I ended up with. I'm pretty sure that when God was rubbing his chin about my job, he also said, "And she needs roommates, so how about I put her in the ABSOLUTE BEST ROOMING ARRANGEMENT FOR HER IN THE WHOLE CITY!?" Two of my roomies are moving to Boston in the spring, and I'm already sad about it. 3. Louisville is super confusing. Well, hello, giant man at the mall. I got lost literally every time I left my house for the entire first week that I lived here. Now, having lived here for almost four weeks, I can say that I only get lost about 40% of the time. I blame my lostness on the fact that we fell back to EST three days after I moved, so I've done a large portion of my new-city-navigating in the dark. 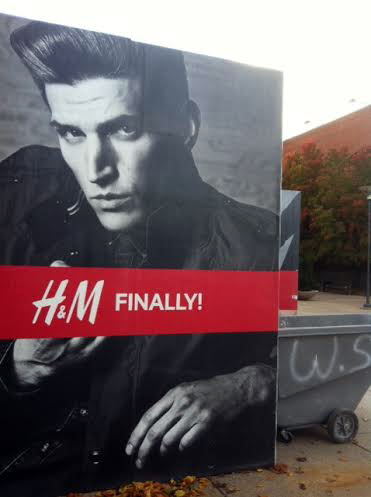 because Louisville just got an H&M! Who wants to make a weekend trip to stay with me and shop at H&M!? See that cute leopard scarf I'm wearing up in that picture above? Yeah, FIVE DOLLARS at H&M. It's bad stewardship not to buy a $5 leopard print scarf. 5. I still miss Missouri. My heart hurts just to mention it. I can't wrap my head around the fact that I've been gone half a year. I remember visiting Columbia when Jane moved there in August, and I cried to my small group and said I needed a job and friends in Louisville, and I know they have prayed for me. I still feel the effects of my church there in so many ways. When people ask me where I moved to Louisville from, I never know what to say. I think I say Versailles half of the time, and I say Columbia half of the time. 6. Versailles is only an hour away. You know what's nice? This year I will drive ONE HOUR home to Versailles for Thanksgiving instead of EIGHT HOURS. I have this personal goal to feel as though I live in both Lexington and Louisville, and I have three trips home planned for the next month, so I think I am succeeding at this goal. 7. I'm going to Sojourn. I'm getting plugged in, and I've joined a small group there. I like Sojourn because the gospel. It feels so overwhelmingly large at this point, but yesterday morning when I walked in, I found that one of the girls from my new small group was waiting for me in the lobby, and that just warmed my heart so much. 8. This is definitely a seminary town. Approximately 80% of the people I've met in Louisville (and 100% of my roommates) either currently attend or have graduated from Southern Seminary. It is 70% intimidating and 30% fascinating. It is not uncommon for our conversations to involve references to Wayne Grudem, John Calvin, complementarianism, heresy, and Albert Mohler. 9. I speak in abbrevs too much. I never realized how ridiculous it sounds when I say BRB, JK, LOL, and IDK (and hashtag) until I caught myself saying them in the office. But part of my job is handling social media, so it's just fitting, right? 10. I am in room-decorating mode. My bedroom looks way too much like what I imagine nuns’ bedrooms look like. GOTSTA get some color. Remember how in my very first post on this blog back in 2007 (!!!) I said that I had ordered a hot pink bedspread for my dorm room? Well,I had that bedspread (and matching hot pink and lime green decor) all through college and grad school, and I got a little hot-pink-and-lime-green-ed out. I know you are all shocked. In thinking about decorating my new room here, I realized I wanted white. All white. It's so calming and peaceful and clean. So I bought a white bedspread. And, y'all, I highly recommend. It makes me feel as though I'm sleeping in a marshmallow. Unfortunately, though, a white bedspread + a white desk + a white chair + a white dresser = a room that looks far starker than I'd expected. So I'm on the lookout for coral and gray accents, but I'm having trouble finding them, seeing as it is NOVEMBER, and retailers aren't crazy about the coral this time of year. If anybody knows where a girl can order a coral throw and some coral pillows up in here, let a sister know. Many of you know that I've slowly been returning to running after several years of being sidelined by chronic leg pain. That old pain that I dealt with in high school and college is almost completely gone. (PTL!) But in trying to get back into running, my knees (which had never before been the problem) have given me a lot of pain on and off. Right now, the pain is on. I wrapped up five more weeks in physical therapy this summer before my move, and I'm not sure how much it really helped. When my knees feel good, I'm so hopeful about how far I've come and about my plans to run until I'm 100 years old. But when my knees hurt, I just want to curl up in a ball and weep. I so quickly revert back to that little 15-year-old girl who had too many doctors tell her they didn't know what was wrong. My head knows it's a different injury, but my heart doesn't. I just want to run. I just want to run. These years of leg pain have been my greatest sadness. 12. The Lord is good. Even when I am in pain. Anticipating life in a new job and a new city was horribly frightening to me, especially before I knew where I'd be working and whom I'd be living with. I wrote a blog post about my fearfulness, but it was a million years long, and I never ended up publishing it. I may still post it after the fact. I prayed all summer for a job and for roommates, and the Lord one-upped my prayers by giving me crazily more than what I had asked for. But I have prayed for nine years that the Lord would heal these legs so I could run again, and the Lord's answers have mostly been confusing. Why bother healing me the first time if you were just going to let me get hurt again, God? I ask that question a lot. But this is what I know: I know that God has always provided for me. I know that he has provided the aforementioned job and roommates as well as every other blessing in my life. I know that he always has more provisions up his sleeves. (Does God have sleeves?) I know that he loves to heal and that he has the ability to heal my legs with a word. With a thought. And I know that if he isn't doing it, he must have a really good reason for not doing it. He withholds no good thing from me. So I will keep praying, and I will keep crying, and I will keep running on the good days, and I will keep hoping and expecting that the Lord has something good up those figurative sleeves of his. 13. This song is on repeat. "My one defense / my righteousness / oh, God, how I need you"
14. You should go see About Time. Anyway, the trailer doesn't do it justice, but, y'all, this movie is so good. I am not normally a movie crier, but there were tears streaming, STREAMING, down my face by the time the credits rolled on this one. I hated Love Actually and LOVED this movie. 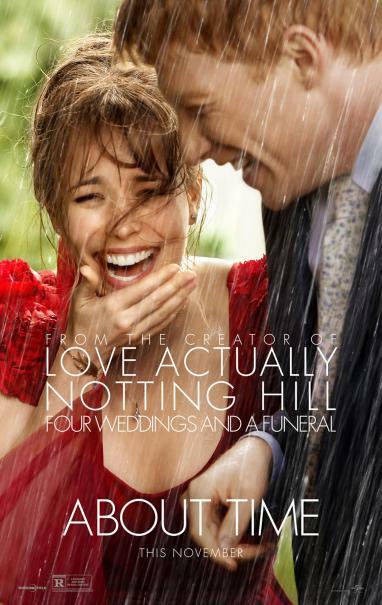 I know what you're thinking: Rachel McAdams is on the cover, so the whole movie is probably about an unrealistic Hollywood touchy-feely romance, and she probably gets cancer and dies. You are so wrong. SO WRONG. On both counts. This movie is about the man on the cover. (No spoilers here.) He learns that he, like all the other men in his family, can travel backward in time. I want you to pause with me right now and contemplate how you think this story will go. A man in a movie can go back in time and undo or redo things. I'm pretty sure that Adam Sandler was in a movie in which he could control time, and all I really remember from the trailer is that he used the power to slow-mo the lady jogger on the road and fast-forward his wife's talking. Eww. But that is a pretty typical Hollywood portrayal of men, right? If they're not totally unrealistic, perfect dreamboat Ryan Goslings, then they're lazy, selfish, and immature Adam Sandlers. But the guy in this movie was just a normal, hard-working, nerdy guy who was faithful to his wife and loved his children and used his time traveling almost exclusively to love his family better. CUE TEARS. My friends and I all came out of the movie just really wanting to get married and have a million babies. For real. How often do Hollywood movies portray love as something that requires selflessness rather than something that justifies selfishness? LIKE NEVER. But this one does, which is why it is my new fave. Anyway, go see this movie. I want to see it 10 more times. p.s. It was rated R for legit reasons, so you may want to read a more detailed review before buying tickets, but I think the good stuff is redemptive enough that the movie is worth watching. 15. I will blog more soon. Now that I have verbally vomited my every thought onto the internet, it's time for me to sign off. I've gotten out most of the blog posts that piled up in my brain, but not all of them. Hashtag winky face. Not six hours after we’d crawled into bed following a day in Versailles, we rose again to continue exploring Europe. My sadness over our abbreviated night of sleep was lessened by the fact that we were GOING TO LONDON, the city I’d always most wanted to see. We got ready groggily and walked through mental and literal fog to the metro, which we took to the train station. For some reason I’d been worried, yet again, that we would be stopped attempting to move from country to country (because we look so menacing and everything). But after getting our passports stamped without a hitch, we arrived at our Chunnel train with seven minutes to spare. Our first stop Monday morning was Rue Crémieux, which is a whole road lined with pastel houses. We went just to marvel at its cuteness. It looks like Instagram and Anthropologie had a street together. I imagine its homes are inhabited by life-size Polly Pockets who keep My Little Ponies as pets. After admiring (and maybe envying) the colorful homes, we made our way to Place des Vosges, which is cute but in a different way. It is the oldest planned square in Europe and was also once the home of Victor Hugo. (Going to France really made me want to re-watch — maybe even read!?!? — Les Mis.) Place des Vosges, as far as I can tell, is like the 17th-century version of a subdivision. Not only were the houses perfectly symmetrical, but the trees were trimmed into rectangles. There was something very Alice-in-Wonderland about it. Paris, I was surprised to find, is much like the cartoons portray it. For instance, in the week we were there, I repeatedly saw men playing accordions on street corners. (I know, right?) In these moments, it felt as though Paris was caricaturing itself. If you thought (like I did) that the cute little Parisian pastry shops were just a cartoon stereotype of the city, you’d be wrong. There’s a boulangerie (bakery) and a pâtisserie (pastry shop) on practically every block of the city. Pastry shops are to Paris what Walgreens are to Chicago.